The latest updates and technology news from our suppliers is posted here as and when we receive these. This gives you the first look at the latest news. How Secure is the Smart Factory? Industry 4.0, IIoT and the connected factory are beyond the point of just being buzzwords. In reality, they offer huge opportunities for manufacturers. But as a smart factory goes online, how secure are communications in and out of the site? How can companies enable remote access and protect themselves against cyber threats at the same time? Remote access to machines has become vital for OEMs and system integrators to meet response-time and up-time obligations. Engineering resources and budgets are limited, therefore efficiency is key. Resolving issues without the need for onsite visits saves time and money, but as businesses embrace connectivity, the threat of a cyber attack increases. Protecting data when connected to a network can be a complicated challenge. Cyber security is top priority for the Danish solution, Secomea. Designed specifically for remote programming, monitoring and data-logging, it provides secure remote access without the need for advanced firewall configuration. ProSoft Technology’s new PLX32-EIP-MBTCP-UA gateway brings together EtherNet/IP, Modbus TCP/IP and OPC UA to ensure that end users’ data has a streamlined path to their ERP and MES, ensuring the information is accessible and actionable. The protocols can be used independently and simultaneously, and the OPC UA Server allows 10 OPC UA sessions at a time. An EDS Add-On Profile allows for simplified integration for Rockwell Automation® EtherNet/IP-based PACs. View product info here. Bakersfield, Calif., March 14, 2018 – Data is available in EtherNet/IP™ and Modbus® TCP/IP equipment around the world – accumulated so end users can analyze and act upon the information to reduce operations costs and improve production. But how can they get to that data? Learn more about ProSoft Technology’s OPC UA-based gateway here! ProSoft Technology’s new PLX32-EIP-MBTCP-UA gateway brings together EtherNet/IP, Modbus TCP/IP and OPC UA to ensure that end users’ data has a streamlined path to their ERP and MES, ensuring the information is accessible and actionable. The protocols can be used independently and simultaneously, and the OPC UA Server allows 10 OPC UA sessions at a time. 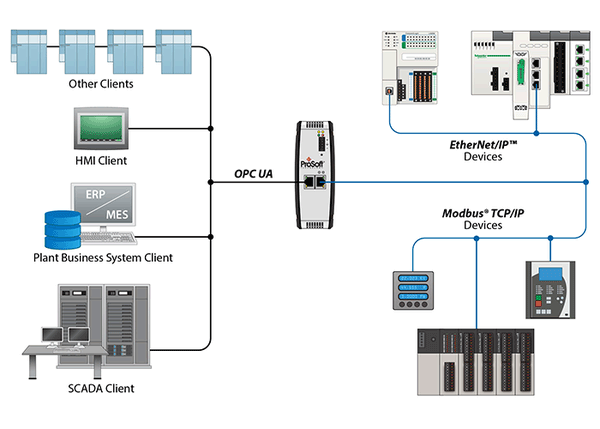 An EDS Add-On Profile allows for simplified integration for Rockwell Automation® EtherNet/IP-based PACs. Westermo is to demonstrate its robust networking solutions at SPS IPC Drives 2017, Europe’s leading exhibition for electric automation. The event takes place on 28th-30th November in Nuremberg, Germany, and will again focus on Industry 4.0. With IT and automation increasingly merging, creating resilient and secure networks that bridge the two areas is critical. 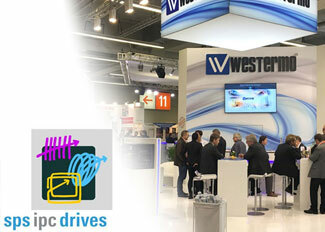 Westermo will therefore present a range of networking solutions on Stand 400, Hall 10, that enable users within processing, manufacturing, utilities and other industries to meet this requirement. Westermo will also demonstrate its new industrial ADSL and VDSL2 router/modem that provides robust and secure communications to remote industrial automation equipment. The BRD-355 uses the Internet to cost-effectively inter-connect systems, allowing SCADA, HMI, PLCs and sensors to communicate with each other, a pre-requisite for any Industrial Internet of Things solution. “In addition to launching new networking devices, Westermo continues to enhance its WeOS operating system, helping to provide greater network resiliency and increase the breadth of suitable applications,” explained Marco. “At SPS IPC Drives we will demonstrate for the first time the ability to use the Media Redundancy Protocol (MRP) with WeOS. By providing support for this open standard ring protocol, WeOS devices can be easily installed as part of multi-vendor networks and also be used to create PROFINET networks. At ProSoft, we usually hear about the ICX35 Industrial Cellular Gateway being used as a remote access solution, allowing users to monitor and troubleshoot their equipment from anywhere in the world. A water company in Cluj, Romania, recently used it for remote access, and found its protocol flexibility to be an asset as well. 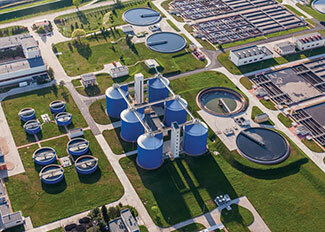 The company needed to collect data from pumping and water treatment stations. The information needed to be sent to a SCADA system from an on-site Rockwell Automation® Micro820 PLC. "The PLCs are EtherNet/IP™-based, but a major factor in the company’s selection of the gateway was its ability to allow them to use that protocol and Modbus® TCP at the same time", said Mihai Marinescu, Technical Support Engineer at the distributor Vestra Industry. With the Industrial Cellular Gateway, the company can now connect remotely to the Micro820 PLC and get data directly into the SCADA system. By being able to take care of minor issues remotely, the company was able to reduce maintenance costs since they didn’t need to send personnel on site as often. The gateway’s support of 4G LTE connectivity worldwide also ensures longevity for the application. The company can now ensure remote connectivity and get up-to-date data from its assets in the field. Jenny Sjödahl is appointed to the position of CEO for the Westermo business entity with effect from 1 November, 2017. Jenny Sjödahl has been with Westermo since August 2016 in the position of Vice President Sales. Jenny has previously worked for more than 18 years in ABB in both Sweden and Singapore in sales, marketing and general management positions. 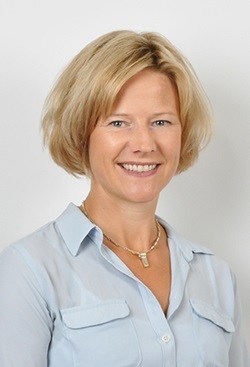 “I am delighted to appoint Jenny to this position and look forward to us working together during the next phase of Westermo’s development”, says Per Samuelsson, President and CEO of Beijer Electronics Group. Lars-Ola Lundkvist will leave the position of CEO after 10 years in the role during which he has been instrumental in building a strong platform for the continued success of the business. “I would like to thank Lars-Ola for his contribution to the growth of Westermo over the past 10 years and I am happy that he will support the company and Jenny during the transition period. Following this, Lars-Ola will move to a role within Business Development, reporting to me and focusing on activities at the Beijer Electronics Group level”, says Per Samuelsson. Westermo has launched an industrial ADSL and VDSL2 router/modem to provide robust and secure communications to remote industrial automation equipment. 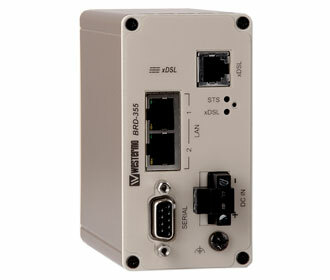 The BRD-355 uses the Internet to cost-effectively inter-connect systems, allowing SCADA, HMI, PLCs and sensors to communicate with each other, a pre-requisite for any Industrial Internet of Things solution. By providing remote access to equipment, the BRD-355 helps to remove boundaries, eliminates the need for time-consuming site visits and creates a network infrastructure suitable for today’s `always on’ society. The BRD-355 has been designed to support applications such as leased line replacement, analogue/dial-up modem replacement, operating broadband over ISDN and providing broadband for utilities. The BRD-355 provides a fixed broadband connection via ADSL or VDSL. Recent broadband protocol technology changes by telecommunication carriers has forced the industrial communications industry to adapt their solutions. The unit therefore supports most ADSL/VDSL2 communication standards including ADSL Annex J and VDSL2 Vectoring. VDSL2 Vectoring enables data rates to be doubled, helping users to achieve up to 100Mbit/s over copper cables. This is particularly useful when fibre infrastructure is unavailable. The cyber security features of the BRD-355 prevent unauthorised access and secure the communication for Internet-enabled applications. An easy-to-use built-in firewall filters incoming traffic, allowing only approved data packets to pass through the device. To inter-connect units securely over the Internet, multiple encrypted VPN technologies are supported, including IPsec and OpenVPN. Because most automation devices are now equipped with an Ethernet port for communications, the BRD-355 has a built-in two-port Ethernet switch. However, to support the need to connect to legacy equipment with serial outputs, the unit also features an RS-232-port. Serial to Ethernet conversion and intelligent modem replacement features help to simplify upgrading these legacy solutions to be part of an IP-enabled network. For easy integration into existing industrial applications, the compact unit has a robust design and can be installed on a DIN rail. All connectors and LEDs have been positioned at the front, providing the user with easy access and fast status feedback. The unit is energy efficient, helping to minimise power consumption, and can be powered from a wide input range from 10 to 60 VDC. An isolated power supply increases immunity against electromagnetic interference and provides greater communication reliability. Swedish Minister for Infrastructure Anna Johansson got the opportunity to meet Westermo during a visit to Västerås earlier in March. Westermo CEO Lars-Ola Lundkvist and Erik Danielsson, VP Global Industries presented the company and experiences from Swedish as well as international rail and infrastructure projects. ”We have gathered vast knowledge about the rail industry by working with companies and agencies such as Trafikverket, Jernbaneverket, Network Rail and SNCF. We are familiar with the challenges in infrastructure projects and we are happy to share our experiences”, said Lars-Ola Lundkvist. Anna Johansson had the opportunity to ask questions and the meeting resulted in a fruitful discussion between the minister and Westermo. 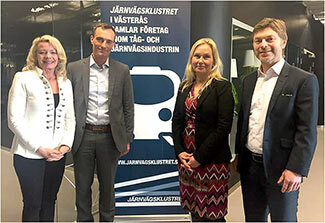 Westermo is a member of the Association of railway companies, Järnvägsklustret, who hosted the meeting. Westermo has launched three new Ethernet devices that support the growing need for higher bandwidth networks with industrial applications. Two new Gigabit switches and a media convertor offer outstanding reliability, robustness and ease of installation, making them suitable for heavy industrial, maritime and rail trackside data communication networks. The MCW-211-F1G-T1G is an unmanaged industrial Ethernet media convertor with one SFP fibre port and one copper port that enables the connection of legacy serial devices to new Gigabit Ethernet networks. The SDW-541-F1G-T4G and SDW-550-T5G are unmanaged Ethernet switches that offer a choice of five copper or one fibre and four copper ports. The units support 100 Mbit/s or Gbit Ethernet, with the SDW-550-T5G also supporting 10 Mbit/s communications. Using Westermo’s range of pluggable 100Mbit or Gbit SFP transceivers, different types of fibre can be easily converted and distances of up to 120km can be achieved. The three devices are designed for demanding applications that require high levels of reliability. All three units feature tri-galvanic isolation, a unique solution that provides isolation between the ports, the shield connection and the power supply. This helps to avoid ground loop currents and increases reliability. By using only industrial grade components the units are robust and provide a long service life. The SDW-541-F1G-T4G has a mean-time-between-failure of over 1.1 million hours. To simplify installation the devices are compatible with all standard industrial Ethernet protocols. For legacy Ethernet equipment unable to support auto-negotiation, a DIP switch can lock data rate and flow control. Network diagnostics is simplified using the port mirroring functionality of the switches. This allows data flow through the switch to be monitored using a network analyser, enabling engineers to use it for fault diagnosis. The units all meet the highest EMC, isolation, vibration and shock standards, and are certified for rail trackside and maritime applications. Their IP21 rating ensures that the units can be installed in locations where condensed water may occur. A power input range of between 10 and 57 VDC and an extended operating temperature range of -400 to +740 C enable the units to support a broad range of applications, even in extreme environments. Highly reliable data communications networks created by Westermo are helping to maximise the availability of two thermal solar power plants in south-western Spain. The Ethernet-based networks have been installed to support the control of 225,000 mirrors at the twin La Florida and La Dehesa concentrating solar power plants. The two plants, owned by Renovables SAMCA, each have a capacity of 49.9 MWe, enough to support more than 45,000 homes. Reliable data communications are essential for the production of electricity. Should connection be lost between the mirrors and control rooms, the collectors are automatically set to safe mode and do not transfer energy. Westermo was therefore tasked with providing a resilient and easy to install solution that would maximise plant availability. Because the La Florida and La Dehesa plants are identical, the same solution was installed at each plant. The networks were designed around a central dual gigabit fibre optic ring using 25 Westermo RedFox managed industrial Ethernet switches. Nine sub rings consisting of 120 Westermo Lynx switches were added to reach out to the different parts of each plant. All individual rings in the network run the Westermo FRNT ring protocol, which enables 20 ms reconfiguration of the network in the event of link (cable or switch) failure. To ensure the installation process was quick and simple, Westermo built, configured and tested both networks in advance in its laboratory in Sweden. An entire network, including all 290 switches, was mounted on a huge ‘network wall’, enabling it to be fully configured and tested prior to installation. The installation process was extremely efficient, with all switches installed and both networks up and running in less than three hours. Since then the networks have proved to be extremely reliable, with no reported problems or serious incidents.